Strikes (hands, legs, elbows); self-defense vs. punches, chokes, headlocks, grabs; tactical movement (standing & ground); concepts of explosive defense & counter-attack; “dirty tactics” & more. Advanced training in all defenses against threats and attacks with weapons; more advanced situational training (i.e. public transportation, attack scenarios where vulnerable bystanders may interfere, etc. ); advanced “review” of all techniques under injury-conditions (bone-fracture, amputation, eye-injury, etc. ); more complex defense/fight scenarios (i.e. while bound, suspended); more complex multiple-attacker scenarios, and more. 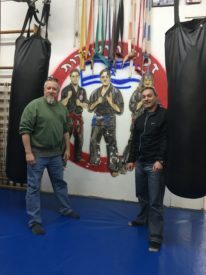 I’ve been training Krav Maga for 2.5 years up and down the West Coast of the United States and sampled many training centers across the country. Blitz Krav Maga is the best on Long Island and among the best in the NYC metro area. I would encourage folks in the city that don’t mind the train ride or drive out to the Island and are looking for high quality instructors to make the additional investment and go to Blitz Krav Maga.